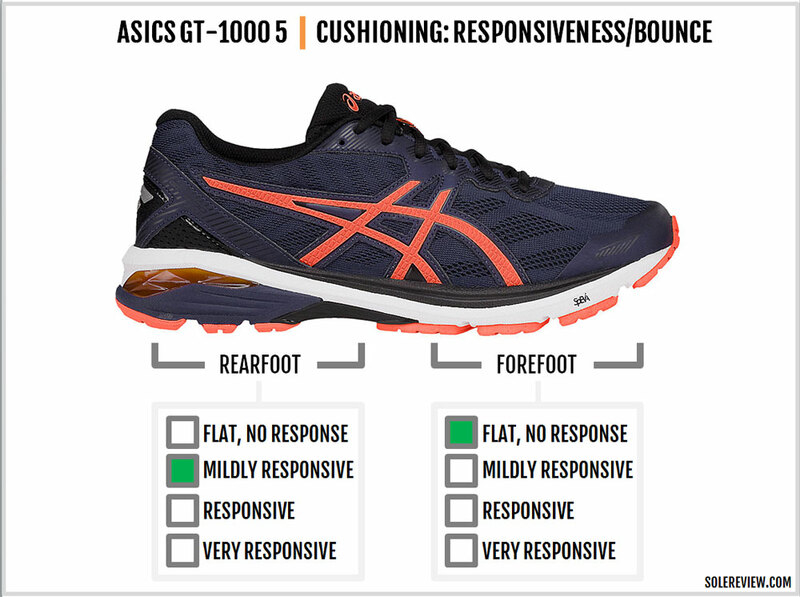 Asics’ marketing pitch: Gel technology for shock attenuation and a more comfortable stride. Upper: Engineered mesh, no-sew and stitched synthetic. Midsole: Triple-density compression molded EVA foam, Gel pads, plastic midfoot shank. 10 mm heel drop. Widths available: D - regular (reviewed), 2E- wide, 4E - extra wide in select colors. Small updates make the GT-1000 5. Like the slightly softer rearfoot ride and the narrower/shallower forefoot. Otherwise a decently cushioned shoe built to a cost. 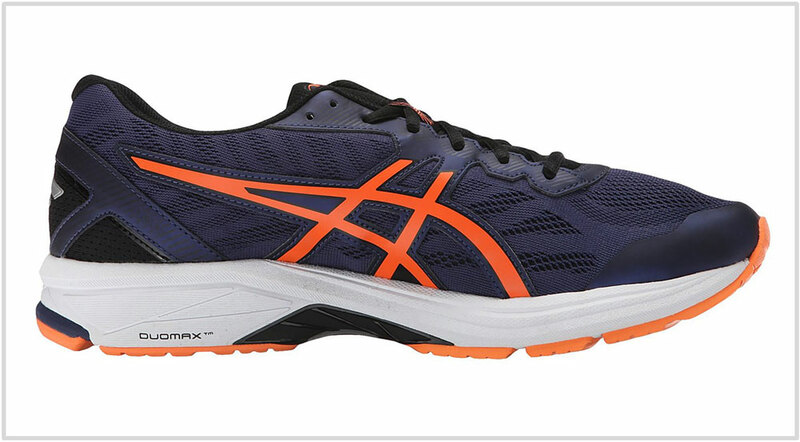 Asics offers a plethora of shoe models for runners who like the feel of a firmer medial post. Right from the expensive Kayano to the (relatively) entry-level GT 1000 5 and Gel Exalt, Asics’s stability assortment spans wide and deep. On one end, there’s the familiar Kayano/GT 3000/2000/1000 family. If you cut across categories, then you’ll discover the lighter DS Trainer 21 and the firmer Gel Foundation 12 as well. As far as medially-posted running shoes go, Asics has it locked down. 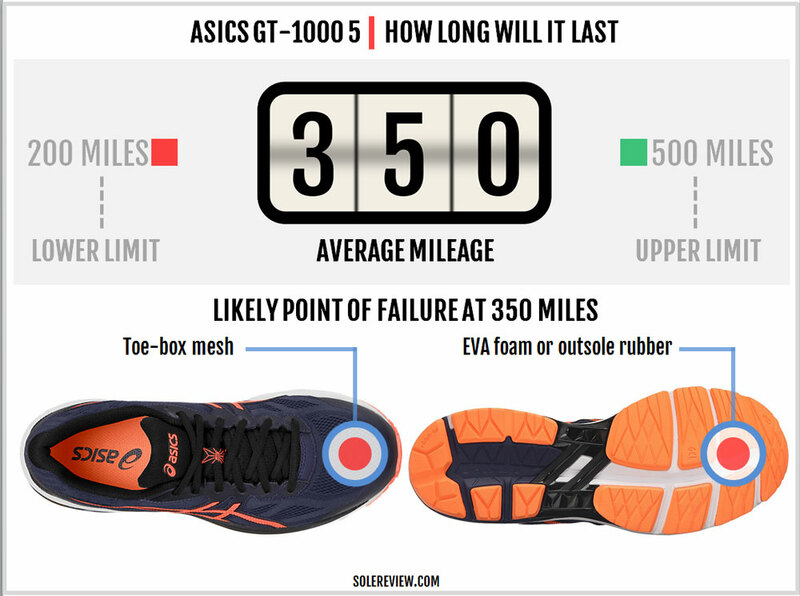 The GT 1000 is a regular fixture in Asics’s playbook. 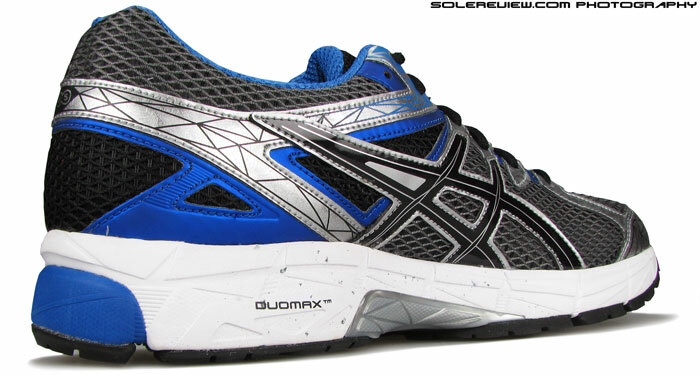 At an MSRP of $100, the GT-1000 is the price of entry into Asics’s stability line featuring the visible Gel unit. It is differentiated from the slightly more expensive GT 2000 and the $160 Kayano 23 by means of a lower material spec and a firmer ride. Since this is an Asics we’re talking about, there aren’t many changes to report on the GT-1000 5 save for a couple. The forefoot has been redesigned, which results in a shallower toe-bumper and a tighter forefoot. The midsole design has been tinkered around with a little bit, which makes the new GT-1000 ride marginally softer than the previous version. There are other updates, mostly cosmetic. But as far as functional changes go, we’ve summed it up. That’ll be the tighter forefoot, a shallower toe-box, and a softer ride than the GT-1000 4. One would assume that the $100-$110 price-band would be filled with various stability shoe models, but it ain’t so. It’s a surprisingly thin crowd for what is undoubtedly a consumer friendly price-point. 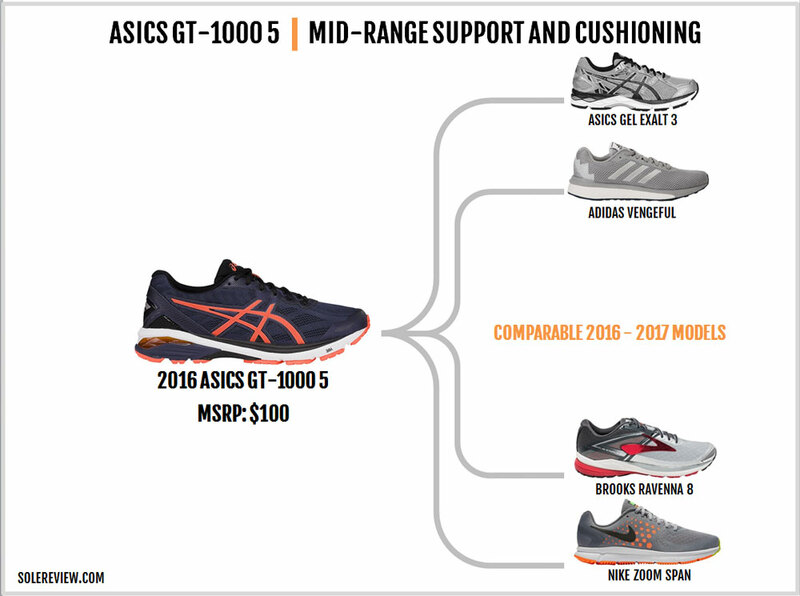 As things stand today, there are only four shoes which compete directly with the GT 1000 5 – the adidas Vengeful, the Asics Gel Exalt3, the Nike Zoom Span, and the Brooks Ravenna 8. There are other shoes of course, but priced higher (>$120) than the GT and with better materials. The Asics Gel Exalt 3 is the GT-1000’s closest match. It shares the same level of material and has a similar ride quality. That said, there are a few design differences which try to justify the $10 price gap (the Exalt is $90). Unlike the GT, the Exalt lacks a visible Gel pocket under the heel. The Exalt uses stitched components for its toe-bumper, which adds more vertical room than the GT. 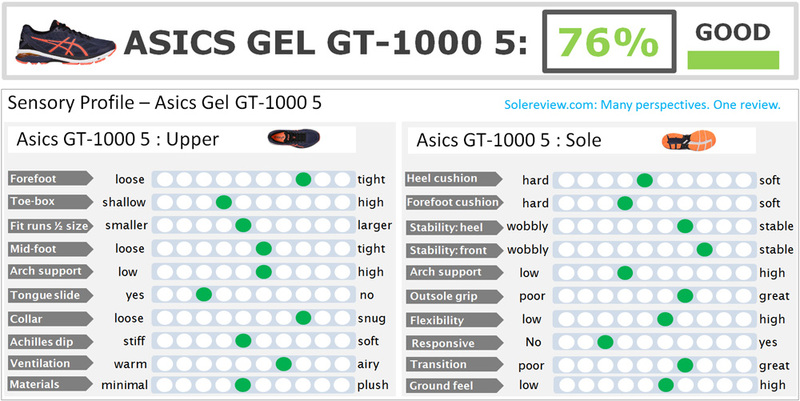 The rearfoot midsole is firmer than the GT-1000 due to the lack of a (soft) visible Gel component. Next in line are the Nike Zoom Span and the Ravenna 8. Both these shoes are softer than the GT-1000; and while the Ravenna 8 is of the same weight class as the GT, the Span is much lighter. Incidentally, both these models use upper materials with a superior hand-feel than the GT. Skip the adidas Vengeful. We reviewed the shoe recently, and we had a low opinion of it. Unless you have a fetish for running shoes which pulls your foot to one side, give the Vengeful a pass. There isn’t a lot going on the GT-1000 5’s upper. The shoe uses a combination of engineered mesh and synthetic – of both a fused and stitched-on kind. Asics uses a no-sew toe bumper, while the rest of the upper has synthetic leather layers stitched over. Over the midfoot, the Asics logo is a large stitched panel which connects to the lacing eyestay. The heel has an internal counter, and its outside is wrapped with a piece of synthetic. Tiny bits of reflectivity are welded on the heel center. The heel lining is sparsely padded with foam, and the counter is molded narrow. The tongue does not have a sleeve, and this isn’t endemic to the GT 1000. Even higher priced Asics shoes follow a no-sleeve policy, and to what intent nobody knows. As expected of such a design, tongue slides happen on the GT 1000 – as it does on the 2000 and the Kayano. A retail price of $100 isn’t exactly what you call affordable, but you get a strong sense that the Asics GT-1000 is built to a cost. The heel and tongue lining lack the premium touch and feel of the GT-2000, though one could argue that the latter is a $20 more expensive shoe. But then, competing models such as the Zoom Span and Ravenna have a far superior material package. Even the engineered mesh used on the GT-1000 5’s upper feels rough to the touch. Although, the GT-1000 5 is far better than some of the earlier versions. The GT-1000 2 for example, emitted an acrid, industrial smell. 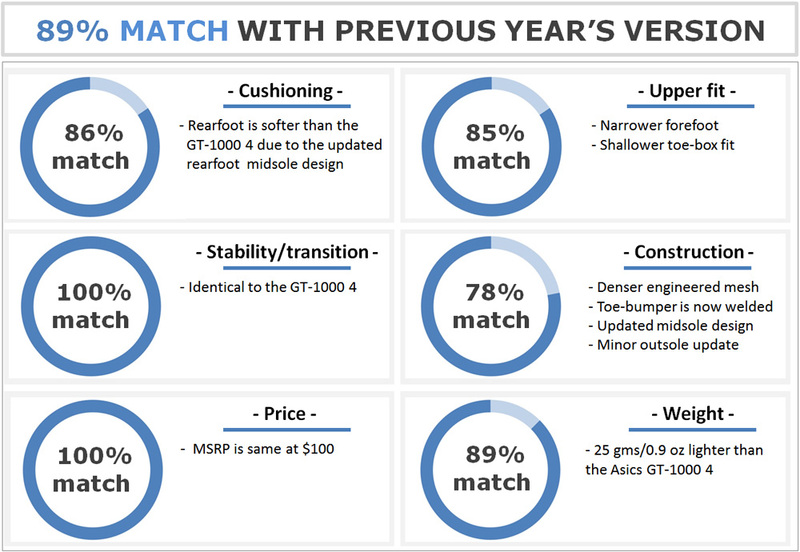 And what has changed on the GT-1000 5’s upper vs. the GT-1000 4? Just a couple of things. The engineered mesh on the GT 1000 4 had larger vents than the new GT 1000. The other update occurs on the GT 1000 5’s toe-bumper. Whereas the previous model used a stitched synthetic, the GT 1000 5 uses a welded toe-cap. The updated toe-bumper isn’t merely cosmetic. The inner side of the no-sew bumper rises higher on the mesh compared to the GT-1000 4. 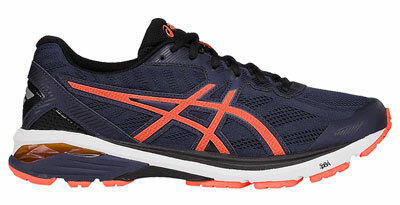 As with most Asics models switching to a fused bumper, the toe-box turns pointy and shallow. The GT-1000 5’s midsole and outsole are constructed the old-school way. The primary midsole is made of a compression molded EVA foam, and a visible Asics Gel pad is placed under the heel. There’s also a separate foam crash pad below the Gel window. True to its ‘stability’ classification, the GT has a firmer medial post embedded into its inner midsole. Only this time, the Duomax wedge is tonal in color and blends in inconspicuously with the rest of the midsole foam. On the other hand, the GT 1000 4’s medial post was made of speckled foam, a design which produced a visual contrast. 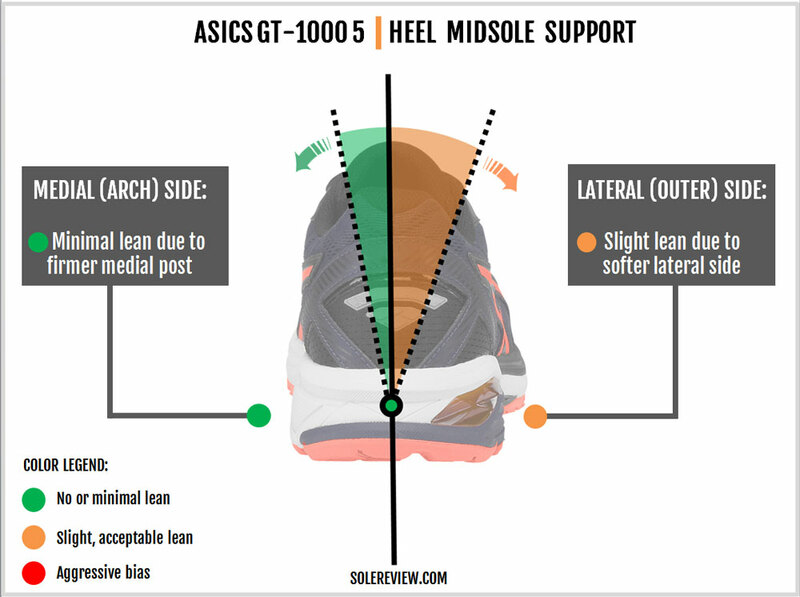 Asics has made a few changes to the foam-Gel-crash pad set-up under the heel. 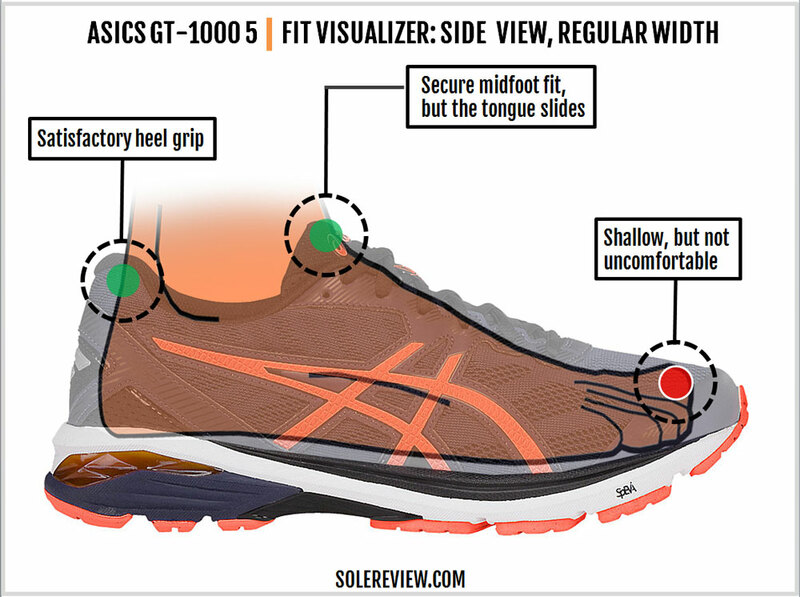 The area of visible Gel is smaller than both the GT 1000 3 and 4; the new Gel placement extends towards the back of the shoe rather than on the side. The crash pad volume is smaller than the previous GT 1000. If you viewed either the GT 1000 3 or 4’s midsole from the back, you’d notice the firmer crash pad forming the majority of the stack thickness. 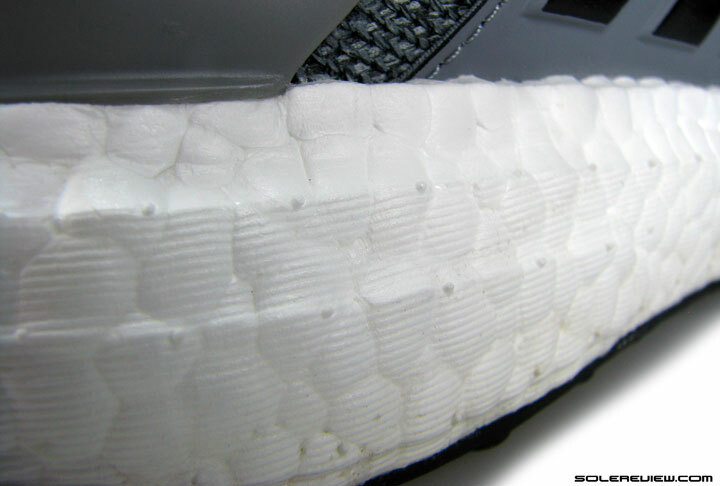 On the GT-5, the crash pad foam is replaced by the softer (white) foam and visible Gel. Both these changes – that on the crash pad and the Gel unit – makes the GT-1000 5’s landing zone softer than the GT 1000 4. Above the midsole, there’s a soft, open-celled layer of foam and a removable insole which also help in padding. You’ll be hard pressed to notice changes on the outsole, and for a good reason. The overall design scheme has stayed virtually unchanged from the GT 1000 4. The forefoot has the same six-piece, blown-rubber configuration, and the rearfoot is covered with four pieces of harder wearing rubber. The crash pad is layered over with a semi-circular rubber piece, and a deep groove gives it freedom to splay. A wide foam channel runs through the center. 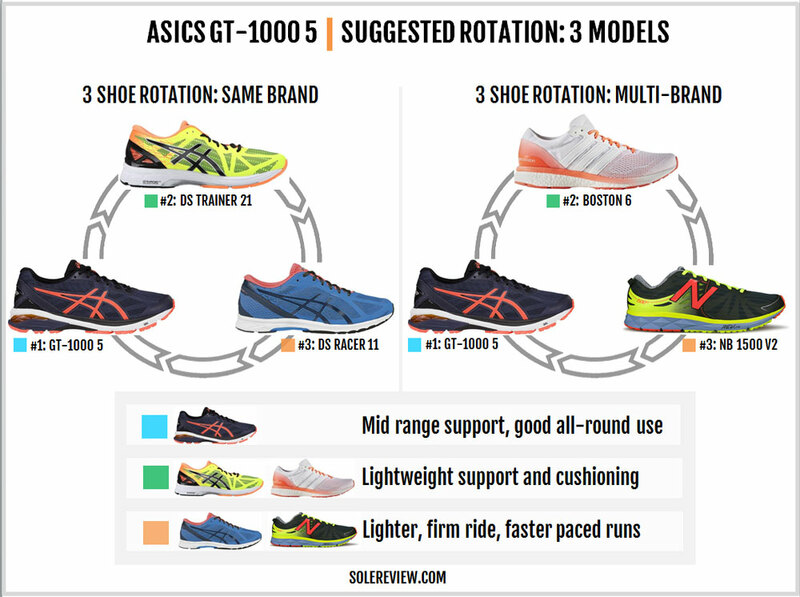 Asics calls this the ‘Guidance line,’ a design feature meant to help with gradual transitions. A full-sized plastic shank bridges the midfoot, as it did on the prior versions of the GT-1000. The GT-1000 uses a tried-and-tested sole design, and it will last a reasonable amount of time. There’s no dearth of rubber covering the outsole, and even though the midsole is made of regular foam, it will hold up for 400 miles or more. If you encounter any durability problem, it won’t be on the midsole or outsole, but rather on the upper. Ever since Asics started transitioning to a fused toe-cap on many of its models, the toe-box height has grown increasingly shallow. This generalization applies not only to the GT-1000 but to pricier models like the Kayano too. With increased shallowness comes the potential rubbing of the big toe against the upper mesh, an action which can lead to early wear and tear. So that’s the only area you need to pay attention to; the rest of the GT-1000 will perform satisfactorily from a durability standpoint. The GT-1000’s toe-box is not as shallow as the Kayano, but in comparison to the GT-1000 4, there’s a reduction in vertical space. The toe-bumper does not squash your toes, but the decreased room is sure to be noticed when trading up from the GT-4. There’s nothing (new) worth pointing out as far as the midfoot and heel fit is concerned. Both the areas grip well, except that the insides don’t feel smooth because of the lower spec material. When compared to industry benchmarks, the GT-1000 5’s upholstery feels rough and unsophisticated. You also have to account for the sleeveless upper construction. The Asics logo is stitched over the engineered mesh, which means that the insides have stitch-lines running amok. There is a lining fabric inside, but its distribution is sketchy and only in specific zones. 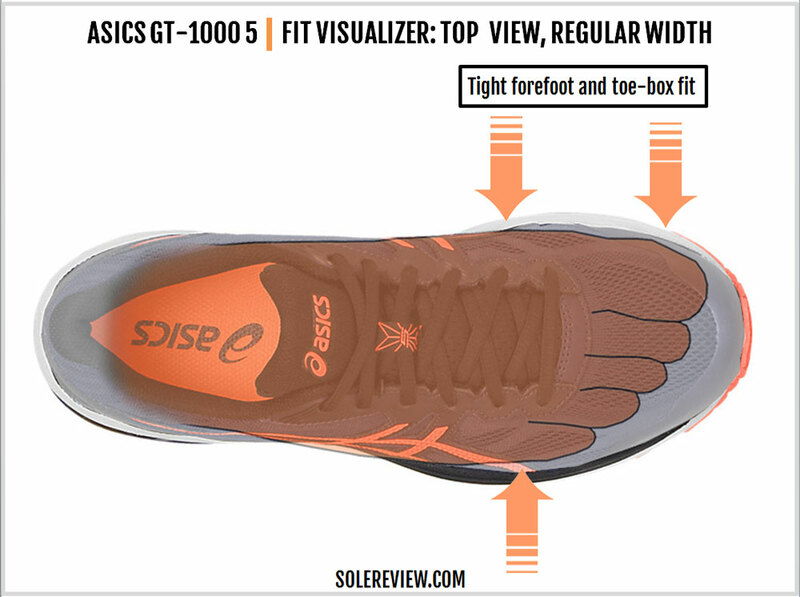 Tight is an accurate description of the GT-1000’s forefoot fit. That’s due to the last (shape) used and the partial inner lining which decreases room, along with the updated toe-bumper design. The engineered mesh used on the GT-1000 is a non-stretch type, which doesn’t help in the matters of forefoot fit. The GT-1000 5’s toe-bumper rises higher on the medial side, hemming the foot in. Unless you’re a narrow-footed runner, you’ll find the GT-1000 restrictive when it comes to foot splay. A quick-fix solution is to skip lacing the first row; the alternative is to buy a 2E (wide) or 4-E width, which the GT offers in select colors. A while ago, we dissected the Asics Gel Nimbus. What we found was that the ‘Gel’ units serve as cosmetic decoration rather than functioning cushioning components. So just know that in any Asics shoe, the cushioning is delivered by the foam midsole rather than the Gel inserts. Like most running shoe marketing, Asics Gel is all hype and little substance. The ride quality of the GT-1000 5 is medium soft. Unlike the softer GT-2000 and the Kayano, the midsole is accented with a firm character. 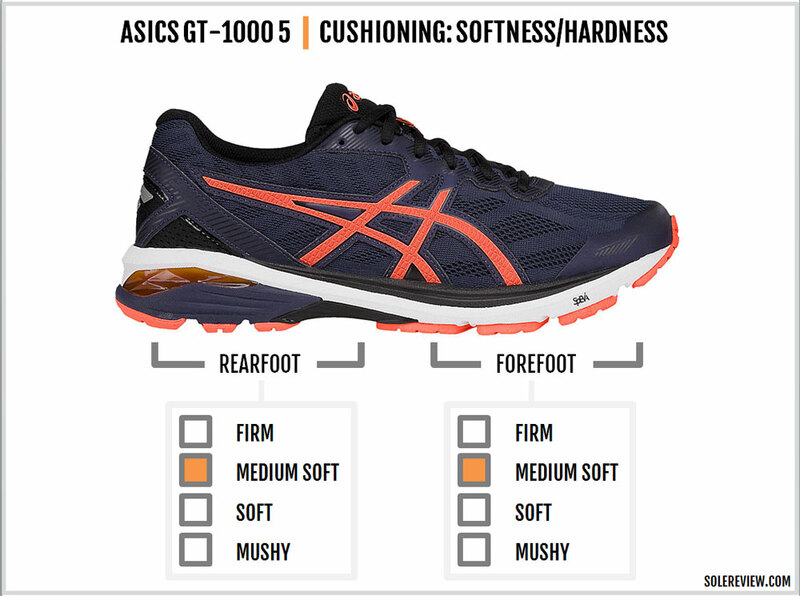 Which actually works very well, because we’ve noticed that overly mushy Asics shoes tend to feel lumpy. That happens because a wide transition groove separates the outsole rubber slabs, and a mushy foam midsole makes those lugs felt underfoot. The GT-1000 5 midsole delivers a medium-soft ride, with the cushioning biased under the heel. The dual-density foam and a visible Gel window create a soft outer edge, and the forefoot feels firmer in comparison. Other parts of the shoe assist in cushioning. You can’t leave out the molded insole and the foam lasting below it, which adds a superficial layer of softness. The guidance line also enhances the cushioning feel, as it flattens with each footstrike and the transition that follows. As it turns out, there’s ample cushioning for a wide range of runs. The GT-1000 5 packs enough padding to run marathon distances if you’re good for it. Its durable outsole also makes the GT suitable for daily training runs. Asics running shoes aren’t very responsive in nature. The all-EVA foam design of the midsole lacks the bouncy behavior of materials like the Boost, Everun or Nike Zoom. In some ways, both Asics and Brooks share certain similarities when it comes to the ride quality. The midsole has plenty of padding underneath, but that isn’t the same thing as responsiveness. An exception to Asics’s general ride behavior would be the Dynaflyte or some of Asics’s lightweight shoes like the DS-trainer. Those models display some degree of spring-back or responsiveness as we know it. 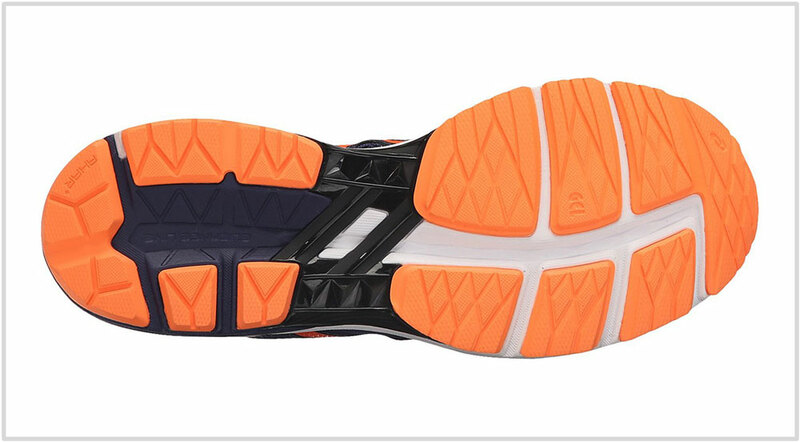 The inner side of the GT-1000 5’s midsole has a firmer medial post. The outer side has two layers of foam sandwiching a visible-Gel unit. Understandably, the GT’s compression is biased towards the lateral side. This is expected behavior of the GT-1000 and 2000, so you have nothing to worry about. The outer lean is within tolerance and does not toss your foot around. The medium-soft ride doesn’t make the GT-1000 5 a speed shoe. The transitions and roll-offs aren’t sluggish but aren’t PR worthy either. That said, the midsole transfers weight in a relatively smooth manner, thanks to the firm foam and the guidance groove which keeps the foot centered. The GT-1000 5 doesn’t shine in a particular area but comes across as a well-rounded shoe. There’s plenty of material in the form of a triple-density midsole and a generous spread of outsole rubber. There’s little to nitpick on the ride quality too. The level of softness feels just right, and the support levels aren’t bad either. 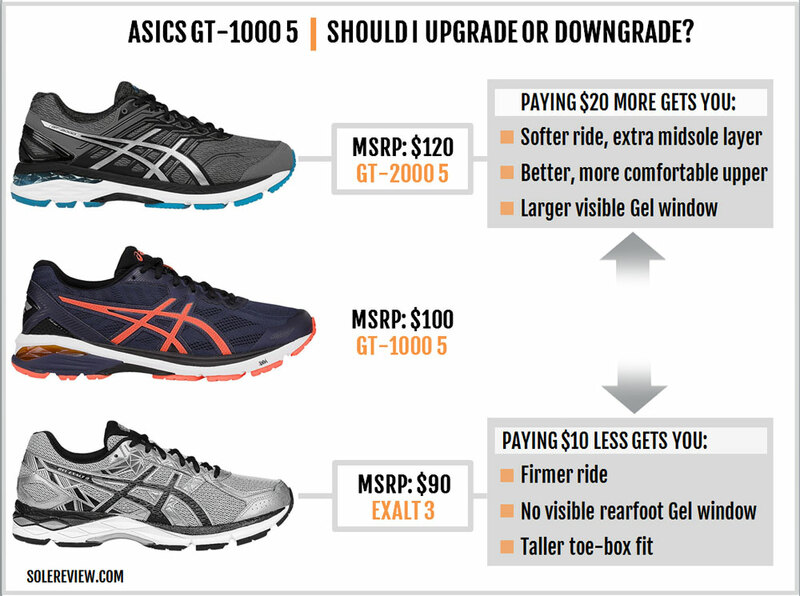 $100 isn’t inexpensive, but within the context of Asics’s assortment, the GT-1000 5 represents a value-for-money package. It would have been a better deal if Asics had paid more attention to the quality of materials used. While the sole composite is well put together, the upper materials feel like they belong to a lower price segment. 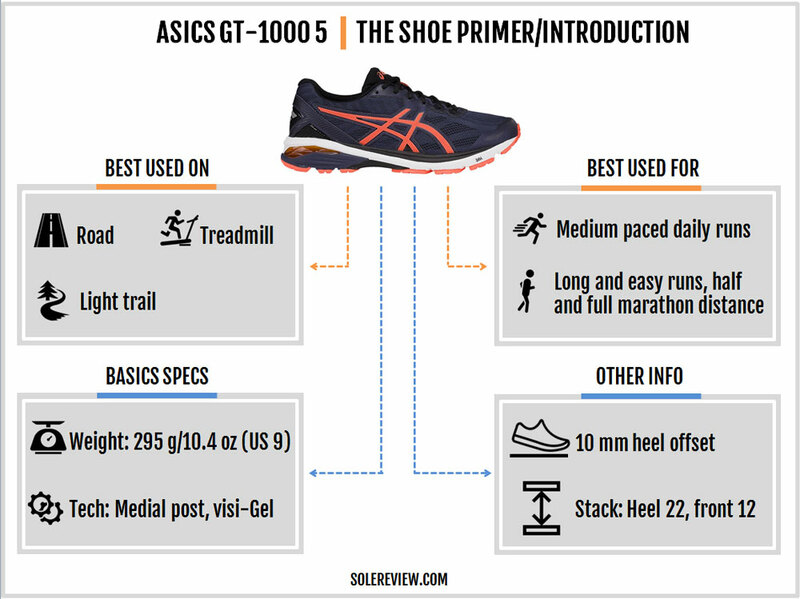 If one compares the GT-1000 to similarly priced stability shoes such as the Brooks Ravenna 8 or Nike Zoom Span, then those shoes come across as more premium in terms of the upper fit and feel experience. And what’s with all the Asics toe-boxes going shallower by the day, and the forefoot tighter? The GT-1000 5 works well as a cushioned daily trainer, so getting another shoe like the GT-2000 or GT-3000 doesn’t make sense. In our view, rotating the DS Trainer 21 and the DS-Racer 11 will provide you with a greater variety. The DS Trainer 21 is perfect for those faster-paced runs and races of varying mileage. Let’s say you spread most of the daily mileage on the GT-1000, and on faster days or long distances races, you can rely on the DS Trainer 21. While it feels faster than the GT, the DS has enough cushioning and support. As for shorter 5K and 10k races, the DS Racer 11 is an excellent rotational choice. Substantially firmer and lighter (it weighs a mere 6.6 oz) than the GT, the DS Racer 11 can be used as a race-only shoe. When you round the shoes up, this is how it works: GT-1000 = daily mileage at easy pace; DS Trainer 21 = faster paced training and marathons; DS Racer 11 = 5K and 10K races, and even a half marathon if you’re accustomed to the firmness. Those considering bringing different brands together can consider the New Balance 1500 V2, which is close to the DS Trainer 21 in some aspects. The 1500’s upper fit is great, and the ride is padded but feels speedy. 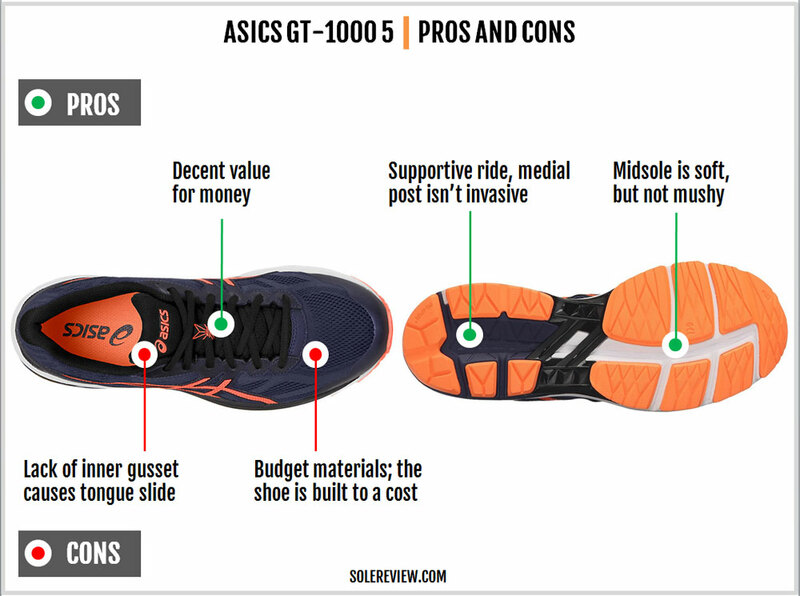 Our second non-Asics recommendation doesn’t have a medial post at all. But the adidas Boston 6 Boost has a supportive ride, and also has the cushioning and durability required for fast training or longer races. Because of the rearfoot updates, the GT 1000 5 has a slightly softer ride than the 4. Not a lot of real-world difference, but nonetheless softer. This change also comes with visual updates, such as the revised placement of the visible Gel and a relocated crash pad. The upper fit turns narrower because of the new toe-bumper which extends higher and longer on the sides. The forefoot feels snugger, and the toe-box is shallower than the GT-1000 4. The GT-1000 5 sheds a surprisingly amount of weight. It goes down to 10.4 ounces/295 grams, which is a significant weight improvement over the GT-1000 4’s 11.3 ounces/320 grams. In most likelihood, trimming the firmer crash pad, the gel unit, and the stitched toe-bumper achieved the weight-saving trick for the GT-1000 5. At a $20 MSRP upcharge, the GT-2000 5 is a softer, more ‘luxe’ version of the GT-1000 5. The difference between these two GT models can be summed by highlighting a couple of areas. The GT-2000 5 has a separate layer of midsole foam running from heel-to-toe, along with a larger Gel window. The GT-2000 5 also uses premium upper materials which delivers better in-shoe comfort. The Gel Exalt 3 is marginally cheaper than the GT-1000. For $10 less, you get a firmer midsole without the visible rearfoot Gel or crash pad, and the upper has a slightly taller toe box because of the stitched toe-cap. If you ask solereview, we’ll tell you that it is better value to spend $20 extra over the GT-1000 and get the GT-2000 instead. It’s an even sweeter deal if you get the last year’s GT-2000 4 at a discounted price.